John Pawson was born in 1949 in Halifax, Yorkshire. After a period in the family textile business he left for Japan, spending several years teaching English at the Nagoya University of Commerce and Business. Towards the end of his time in Japan he moved to Tokyo, where he visited the studio of Japanese architect and designer Shiro Kuramata. Following his return to England, he enrolled at the Architecture Association in London, leaving to establish his own practice in 1981. 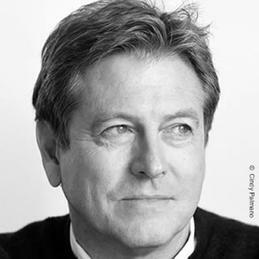 From the outset, Pawson's work focused on ways of approaching fundamental problems of space, proportion, light and materials, rather than on developing a set of stylistic mannerisms - themes he also explored in his book Minimum, first published in 1996, which examines the notion of simplicity in art, architecture and design across a variety of historical and cultural contexts. Early commissions included homes for the writer Bruce Chatwin, opera director Pierre Audi and collector Doris Lockhart Saatchi, together with art galleries in London, Dublin and New York. Whilst private houses have remained a consistent strand of his work, subsequent projects have spanned a wide range of scales and building typologies, from Calvin Klein's flagship store in Manhattan, airport lounges for Cathay Pacific in Hong Kong and a condominium for Ian Schrager on New York's Gramercy Park, to a set for a new ballet at London's Royal Opera House, the interior of a 60-foot sloop and the new Cistercian monastery of Our Lady of Novy Dvur in Bohemia. His RIBA award-winning Sackler Crossing - a walkway over the lake at Kew's Royal Botanic Gardens - opened to the public in 2006. I agree to receive information regarding the competition and other activities and initiatives of the Roca Group.